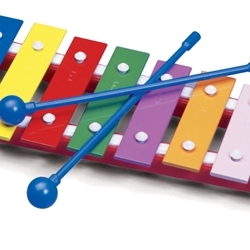 A perfect octave that's easy to play and carry around. Each tone is a different color, a different size, and has it's own name. A pair of plastic mallets are included. Songs and playing activities included – safe for ages +3 years.